Mhumhi breaks up a fight. The crowd of yapping foxes started to clear rapidly from around the fight once Mhumhi appeared, his size and painted coat enough of a deterrent. The golden jackal backed up a few steps as well, licking her muzzle and growling. The domestic dog stood stock-still, though his tail was tucked. He still had the meat tightly clenched in his bleeding jaws. “Are you police?” said the golden jackal, glaring at Mhumhi. The jackal looked him over, her lips still drawn back from her teeth. She was half the size of the big domestic, but easily twice as fierce, especially as Mhumhi could see the teats hanging swollen from her belly. Mhumhi glanced at the domestic, uneasy now at the size and muscle of him- he was shorter than Mhumhi at the shoulder, but far broader and heavier-looking. The domestic did not move, though, just clutched his meat and stared at Mhumhi with those unnerving blue eyes. Her last statement came out high-pitched and confused, and she stared at Mhumhi with an expression of consternation. Mhumhi glanced down at the fox, whom he knew quite well as one of his neighbors, and who definitely knew he was not a member of the police. 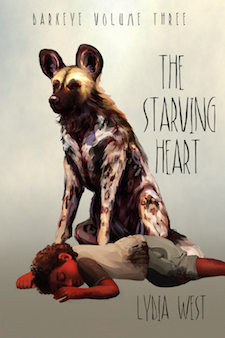 “You little rat,” growled the jackal, and the fox ducked behind Mhumhi’s front legs. This brought out a great deal of yapping and whining from the foxes that still lingered in the area. Domestic dogs were not well-liked, but they were liked far better than meat thieves. The golden jackal trembled a little as she growled. The jackal seemed shocked by his statement, and glared at him another moment in confusion. The domestic also gazed at him. Someone in the crowd barked, and the jackal jumped, and snapped angrily at the air. Mhumhi went stiff with anger and raised his own lip, but his tail tucked as she advanced on him, fur bristling. “You’ve got no authority here! You’re as much as a domestic yourself, you coward!” She snapped her jaws again, threatening, and Mhumhi had to scramble a few steps backwards, ears back, and nearly tripped over the fennec fox as it darted out from underneath him and into a storm drain. With an angry squeal, suddenly Sacha ran in front of him, all twelve pounds of her, and confronted the jackal with a terrible snarl. “Leave!” cried Sacha, and lunged forward, and the jackal leapt and twisted in midair to get away. Kutta added her chatter, and darted forward and snapped at the jackal, who was forced to back up even further. “I’ll tell the real police about this!” she snarled, but she knew she had lost the encounter pretty badly. She ran from the scene with her head and tail very low, and disappeared around a block of houses. Mhumhi shut his eyes, quite overwhelmed, then opened them again. The domestic was slinking away in the opposite direction that the jackal had gone in. The domestic looked back at him and tucked his rump and ran in a sideways, frightened scuttle. Mhumhi chased him, catching up easily with his lanky legs, wagging his tail. He caught a flash of the dog’s vivid eyes as he looked back again. The meat- not more than a few mouthfuls, covered in blood and drool- swung from his teeth. “I won’t steal your meat!” Mhumhi cried, running to bound along directly beside him, so that he cringed away into a doorway and had to stop. The domestic either believed him or recognized he had no choice in the matter, for he slowly put down his meat. Mhumhi wagged harder and licked at the blood caking his muzzle as the dog flinched away. “No,” said the domestic. His voice was rough and blunt. The domestic hesitated, his jaws open, his lower canines just grazing his upper lip. His thick pointed ears were laid flat against his skull. The domestic had shrunk back from his excitement, and flinched as Sacha and Kutta came up to flank him. Mhumhi had to glance at Sacha, but she was standing still, her small eyes devoid of expression. Mhumhi and Kutta looked at one another, Mhumhi’s tail wagging hard, Kutta’s waving more slowly. Mhumhi glanced at Kutta again, though she was focused on Sacha now. Domestics could not regurgitate for pups the way they could; they all knew that very well, which was likely why the domestic had been forced to carry the meat in his jaws, a moving target in the city full of dogs. He seemed loathe to answer Sacha, glancing furtively from side to side, but a stern whine brought his attention back to her. “Sacha!” cried Kutta. Mhumhi felt stunned. With a final whine, the domestic snatched up his meat and leapt straight over her, pushing roughly between Kutta and Mhumhi to dash pell-mell down the street beyond. “Sacha,” Kutta said, sounding weary. Sacha seemed to tense, and Kutta drew nervously away from the two of them. Sacha gave both of them a furious look and ran down across the road, back towards their home. When she had got twenty or so feet away from them she slowed to a walk, but her tail was still pointing up. “Mhumhi, I’m sorry,” said Kutta, licking at his ears, but he was still watching Sacha walk away, looking tinier and tinier. “All right,” said Mhumhi, but he was feeling very hollow now. The words that the blue-eyed dog had said should have filled him with hope, but now he could only doubt them. Where they true? And if they were, what was their small, domestic mother doing going towards the park where the massive pack of painted dogs hunted for red meat? “You could have taken him, you dumb brute.” wasn’t the jackal a she? “Mhumhi did not respond, head low: despite what Kutta might say, he never could stop thinking about his oldest sister’s words” needs a period.